Hello and thanx for your precious help, if possible. 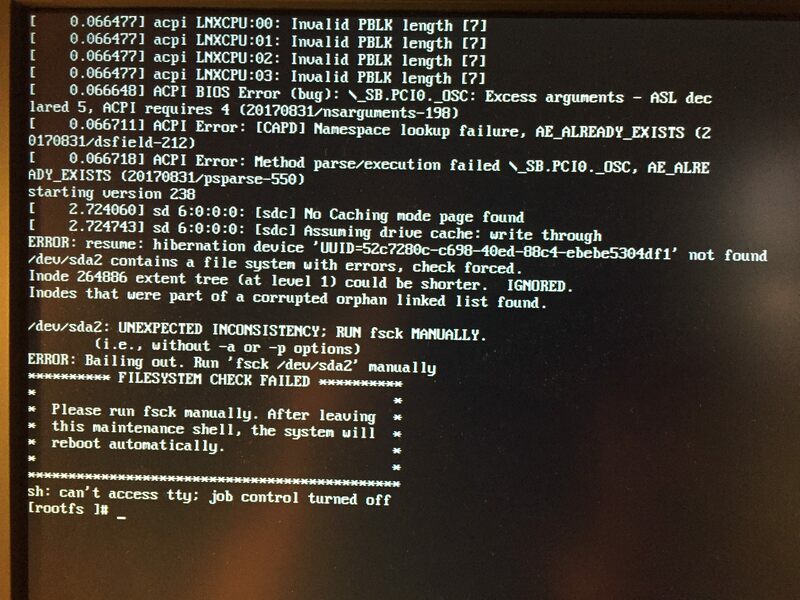 We had an electric shutdown and now antergos which worked to perfection until now does not boot correctly anymore. I have read several topics but have not enough knowledge to understand what I need to do. Attached is a screenshot of the present situation. Maybe some of you know how to solve the pb? Many thanks in advance. I would first start up with live iso if you have Antergos still on a stick or CD. Thank you. Here is the outcome. /dev/sda2: Inode 264886 extent tree (at level 1) could be shorter. IGNORED. Inode 264886 extent tree (at level 1) could be shorter. Fix<y>? @joekamprad - Thank you, after replying “yes” to all “Fix?” questions, the system boots normally, all fixed. Thank you very much once again! then you are a lucky one!